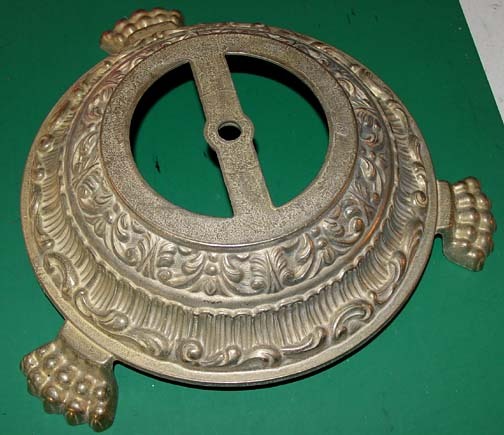 Table Lamp Bases, Floor Lamp Bases, Lamp Replacement Parts, Lamp Parts in stock. If we don't have it in stock today, we can usually get what you're looking for within a week or 10 days. 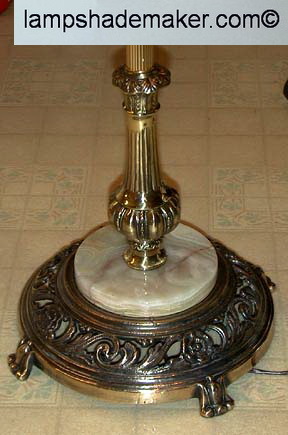 Call if you're looking for a particular lamp base not shown here. 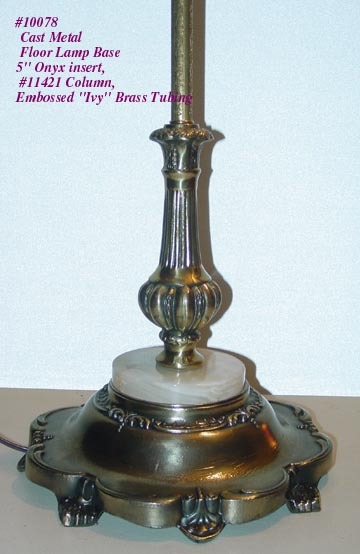 Visit our other links on the home page for other lamp parts and beautiful custom lampshades and Victorian lampshades for table lamps, Bridge Lamps, and floor lamps. Satisfaction guaranteed. Made in the USA! We accept credit card payments directly. Any other credit card payment can be made through PayPal at https://www.paypal.com. Call first to determine shipping charges. 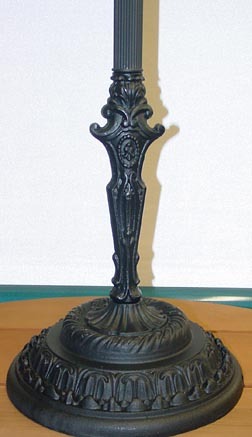 Satin Black Cast Iron Column and Base. 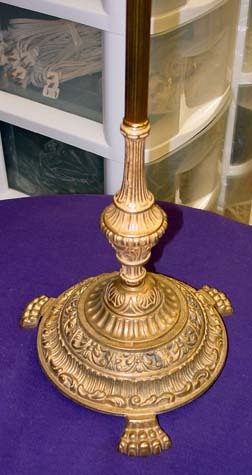 Heavy High Quality Cast Italian Brass Break and Column for Floor Lamp or Bridge Lamp, slips 1/4 IP pipe. 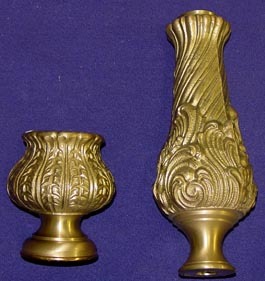 Brushed Brass Column #50222KL height 7-1/2", top diameter 1-3/8", bottom diameter 1-1/2"
Brushed Brass Break #50252KL 3-1/2" high, inside top diameter 1-3/4", bottom diameter 2"
The dull color shown on Right above is Unfinished Brass; the middle one is Polished & Lacquered for additional $10 per piece). Other components that can be used with the E-5310 Base are shown below. 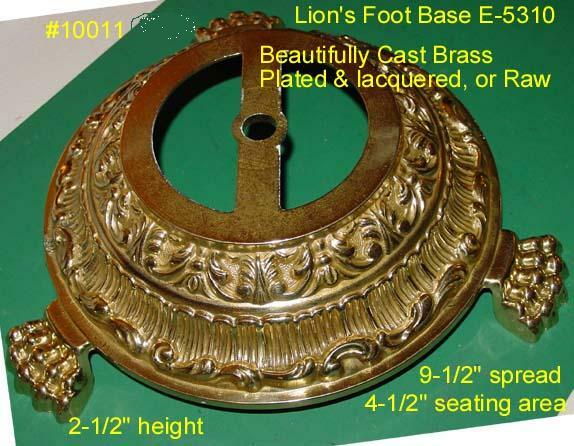 "Lion's Foot" - High quality Brass four-part base assembly for lamps with size 1/8 IPS pipe. Note: These pieces can be modified to fit 1/4 IPS floor lamp pipe by drilling the center hole larger. E-5310 Base only, 9-1/2" spread, 2-1/2" tall, 4-1/2" seating area. 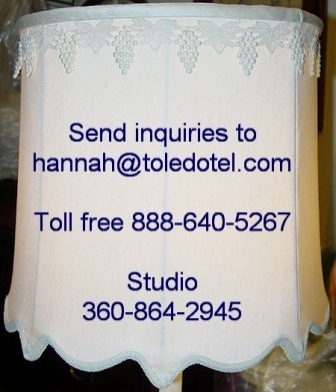 Call first to obtain shipping charges and availability of items.